Myanmar held elections early November as the capstone of a wider range of “reforms” it has undertaken as an apparent means of escaping decades of sanctions leveled against it by the West. Predictably, the National League of Democracy (NLD) headed by the Western vaunted, Nobel Peace Prize Laureate Aung San Suu Kyi was declared the winner in a “landslide” by Western papers even before the official count was revealed. Myanmar’s Aung San Suu Kyi has told the BBC she believes her party has won a parliamentary majority, in her first interview since the historic elections. Early results point to a sweeping victory for her National League for Democracy (NLD), but final official results will not be known for days. The election was seen as the most democratic in Myanmar for 25 years. In an nterview with the BBC’s Fergal Keane, Ms Suu Kyi said the polls were not fair but “largely free”. She said there had been “areas of intimidation”. Suu Kyi’s comments regarding “areas of intimidation” are particularly ironic, with the BBC itself reporting before the elections that Suu Kyi’s own followers had protested the sitting government’s attempts to grant Myanmar’s Rohingya minority identification cards and the right to vote in these very polls. Rohingya Muslims will not be able to vote in Myanmar’s referendum after President Thein Sein withdrew temporary voting rights following protests. Hundreds of Buddhists took to the streets following the passage of a law that would allow temporary residents who hold “white papers” to vote. These “Buddhists” cited by the BBC are of course Aung San Suu Kyi and the NLD’s “Saffron” foot soldiers who led the pro-NLD riots during the “Saffron Revolution” in 2007. Their support for Suu Kyi’s political party explains Suu Kyi’s own hypocritical silence over the unjust treatment the Rohingya have suffered at their hands – the same sort of injustice Suu Kyi has claimed to be standing up against as part of her “pro-democracy” platform. So compromised is Nobel Peace Prize Laureate Suu Kyi, that even the Western press has noted it in recent months. The same BBC who now claims recent elections are “historic” despite the fact that the winning NLD benefited from its supporters’ campaign to disenfranchise over a million Rohingya from casting their votes, had previously noted her silence. In parliament, where she sits as an opposition MP, the 69-year-old frequently criticises the government for the slow pace of reform, and restates her increasingly forlorn demands for constitutional change. But on the persecution of Myanmar’s most famously forgotten minority Ms Suu Kyi is silent. …there are currently about 800,000 people in western Myanmar, denied the most basic of rights and discriminated against due to the circumstances of their birth. They’ve been fleeing into the hands of cruel trafficking rings because they’re poor and desperate. From a simple human rights perspective it’s a continuing outrage that should shame us all. So why, despite the calls from around the world is Ms Suu Kyi, the Nobel Peace Prize winner, reluctant to raise her voice? The simplest explanation, voiced repeatedly over the last few weeks, is that she’s always been a pragmatic politician not a human rights activist. By defending the Rohingya, Ms Suu Kyi would immediately put herself at odds with powerful Buddhist nationalist groups, potentially changing the dynamics of this year’s all important general election. If Not for Human Rights, Why Does the West Love Suu Kyi So? Aung San Suu Kyi, Burma’s democratic opposition leader, called for foreign investment to solve the malaise of youth unemployment in her troubled homeland in her first speech in decades on European soil. Her speech was dedicated to the cause of eradicating forced labour in Burma. “The international community is trying very hard to bring my country into it and it’s up to our country to respond the right way,” she said. 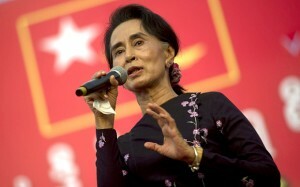 Within the same article, Suu Kyi’s troubling statements over her eagerness to see Myanmar, which she and the Western press still call by its British colonial nomenclature of “Burma,” folded into the Western “international community” through “foreign investment,” is softened by various references to her “activism” and the various awards she picked up during her trip to Europe. It is clear that Suu Kyi’s “activism” is serving as cover for her true role in Myanmar’s upcoming future, which entails the incremental transfer of Myanmar’s nationalized resources, industries, and infrastructure to foreign corporations. Just as Suu Kyi and her NLD’s abuse of the Rohyingya have been spun and covered up for as long as it suited the Western media, her role in disenfranchising the rest of Myanmar’s population with her and her party’s growing influence will likewise be obfuscated, spun, or otherwise completely buried. And Suu Kyi’s silence over the Rohyinya, and the horrific injustice they have been subjected to by her most stalwart followers serves another, more sinister purpose. At any time Suu Kyi and her NLD attempt to pursue policy inconsistent with those foreign interests who helped them into power, the Western media who has so far remained silent and complicit can just as easily begin reporting the truth, including the fact that Suu Kyi’s recent victory at the polls was predicated on the disenfranchisement of over a million victimized Rohingya. All empires throughout history have ruled not only directly, but indirectly through various agents. Building up movements, leaders, and power blocs that are entirely dependent on foreign cash and political support, ensures enduring loyalty. In the days of the Roman Empire, the children of foreign leaders would be held hostage in Rome as an insurance policy for continued loyalty. These children would be educated, and more importantly, indoctrinated in all ways Roman, before being sent back home where they would bring that indoctrination with them. Today, it is one’s fictional image and legacy that is held hostage, with disobedience met with uncharacteristically honest news coverage of unsavory realities that usually go unreported. Instead of a leader’s children being indoctrinated and sent back to plant the seeds of greater foreign influence, entire multi-million dollar education programs seek to train and send back by the hundreds “activists” and “youth leaders” to infect a targeted nation’s body politic. Suu Kyi, her NLD, and their various allies across “civil society” are no different. The National Endowment for Democracy (NED – see Appendix 1, page 27) has been at the forefront of our program efforts to promote democracy and improved human rights in Burma since 1996. We are providing $2,500,000 in FY 2003 funding from the Burma earmark in the Foreign Operations legislation. The NED will use these funds to support Burmese and ethnic minority democracy-promoting organizations through a sub-grant program. The projects funded are designed to disseminate information inside Burma supportive of Burma’s democratic development, to create democratic infrastructures and institutions, to improve the collection of information on human rights abuses by the Burmese military and to build capacity to support the restoration of democracy when the appropriate political openings occur and the exiles/refugees return. How democratic institutions representing the people of Myanmar can be created by foreign interests who refuse to even call Myanmar by its official name is no mystery. The NED has absolutely no intention of creating anything resembling democracy in Myanmar. Instead, it is seizing Myanmar’s political institutions under the guise of democracy, creating and controlling everything they can within the country, while gradually wearing down existing institutions that remain beyond their reach. The report provides further details regarding foreign backing among Myanmar’s “opposition” and NGOs revealing that everyone from the New Era Journal and the Irrawaddy, to the Democratic Voice of Burma (DVB) radio, were all created by and continuously funded to this day by the US State Department. The State Department provided $150,000 in FY 2001/02 funds to provide scholarships to young Burmese through Prospect Burma, a partner organization with close ties to Aung San Suu Kyi. With FY 2003/04 funds, we plan to support Prospect Burma’s work given the organization’s proven competence in managing scholarships for individuals denied educational opportunities by the continued repression of the military junta, but committed to a return to democracy in Burma. What is clear is that Suu Kyi’s movement represents decades of funding and backing by the West, with entire institutions created from scratch by foreign interests to assist Suu Kyi and her NLD into power. Her movement would likely not even exist without the endless millions poured into it annually by the United States and British governments. The West’s “human rights” organizations have meticulously documented, then intentional spun or buried evidence regarding her movement’s role in the continued attempted genocide against Myanmar’s Rohingya minority. Likely, this documented evidence serves as an insurance policy in the unlikely event Suu Kyi’s movement transcends the need of the many millions poured into it from abroad. Thus, Suu Kyi, her NLD, all of its partners across the growing myriad of US and British-funded NGOs, and the “Saffron” mobs themselves represent not only a betrayal of Mynamar’s hard-earned independence from the British Empire, but traitors who are compromised on multiple levels, serving as multiple vectors through which foreign interests can re-enter and re-conquer Myanmar. Suu Kyi’s campaign was based on much rhetoric and very little substance. Democracy is but a means, not an end, so her “pro-democracy” stance has very little meaning now that elections are over and she finds herself in power. Seeking vast foreign investment is also not a policy. It is the deferral of leading the development of one’s own country to foreign interests. The fact that Suu Kyi’s entire movement is a foreign-backed creation, extorted regarding its own despicable treatment of Myanmar’s Rohingya minority, and lacking any semblance of an independent national policy, makes Myanmar’s recent elections “historic” indeed. It is an unprecedented moment of weakness that now exposes the country to a multitude of threats it is unable to protect itself against. Those who supported Suu Kyi in good faith will be quickly disillusioned when the inept leader fails to materialize the fantastical “democratic” utopia she has promised for decades. They will be quickly disillusioned as her followers’ insatiable barbarism transforms from street violence into nationally sanctioned genocide. They will be disillusioned as Exxon, Chevron, BP, Monsanto, and other hated corporations who have circled above like vultures waiting for this moment of weakness, finally land and prepare to bury their heads in this vulnerability. Suu Kyi and her NDL, however compromised they are, also present an unprecedented opportunity to Myanmar’s ruling establishment. For decades Suu Kyi has been able to protest, complain, and rhetorically pelt Myanmar’s current political order for its failures and the state of impoverishment and repression the people of Myanmar allegedly face. Now it will be her turn to take full responsibility for Myanmar’s plight. Poverty, injustice, violence, and real national progress cannot be dealt with through “democracy” and “foreign investment.” No matter what Western headlines say to the rest of the world, the people in Myanmar will see for themselves the shortcomings, failures, and incompetence of Suu Kyi and her NLD. Myanmar will become well-acquainted with Suu Kyi’s true colors, and may decide the devil they knew was tame in comparison. Upon that realization, Suu Kyi, her NLD, and any possible successor to the aging foreign-proxy will be permanently swept from any prospect of ever leading the country again. For Myanmar’s neighbors, caution in dealing with any government led by Suu Kyi’s NLD would be wise. The foreign interests that have created this “historic” moment of weakness in Myanmar, seek to do so across all of Southeast Asia, and in many instances, have already done so. The Shinawatra clique in Thailand represented foreign interests and their failed attempts to overwrite Thailand historically, culturally, politically, and socioeconomically. Malaysia’s Anwar Ibrahim, now incarcerated, also sought to herald Malaysia’s re-conquering by Western interests.